Quickmixes are albums that designers have already made for you! 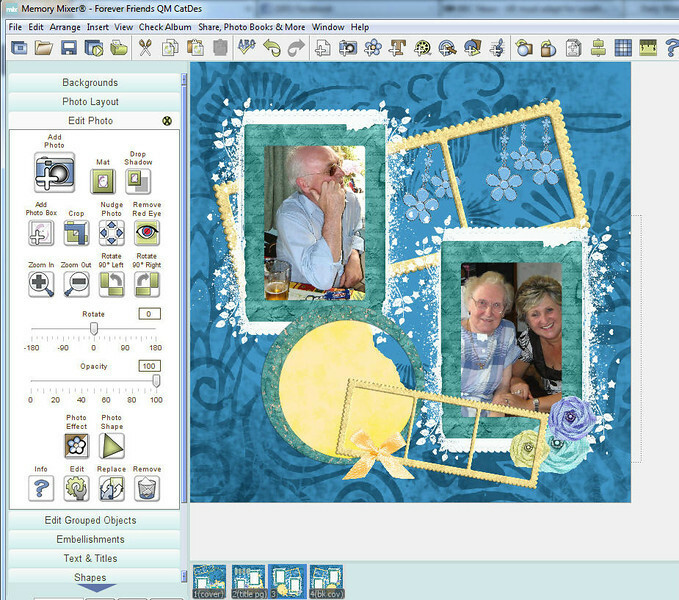 All you need to do is add your photos and any title or extra embellishments you want. You can also move things around in Quickmixes. There are lots already included in the program. 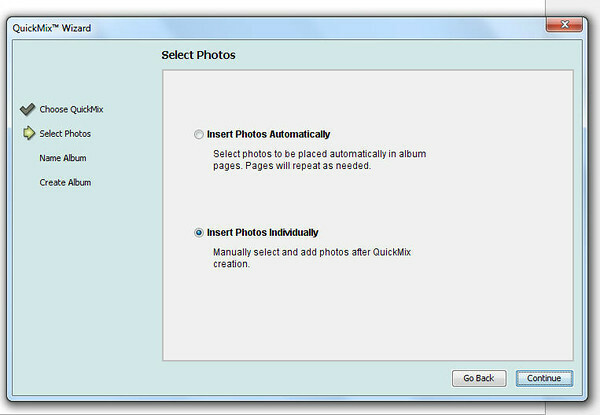 "Insert Photos Individually" is the default setting. Leave it at that. The autofill feature in Memory Mixer is brilliant but we're not using it right now. Now you get to name your album. You can always change it later but it's best to get into the habit of naming it properly at the beginning. If you keep naming albums "Album 1, Album 2" etc you will forget to rename them and you'll never be able to find anything! 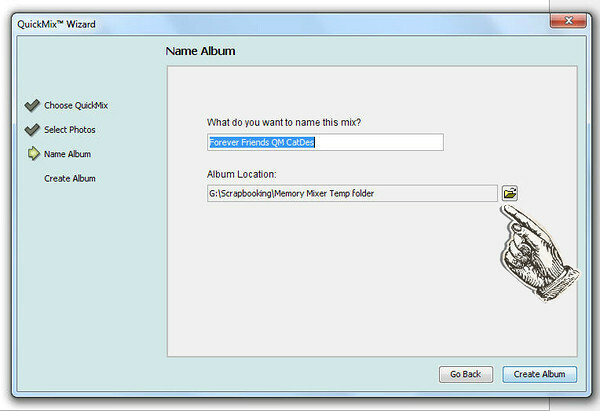 You can also choose where your album is stored on your computer. 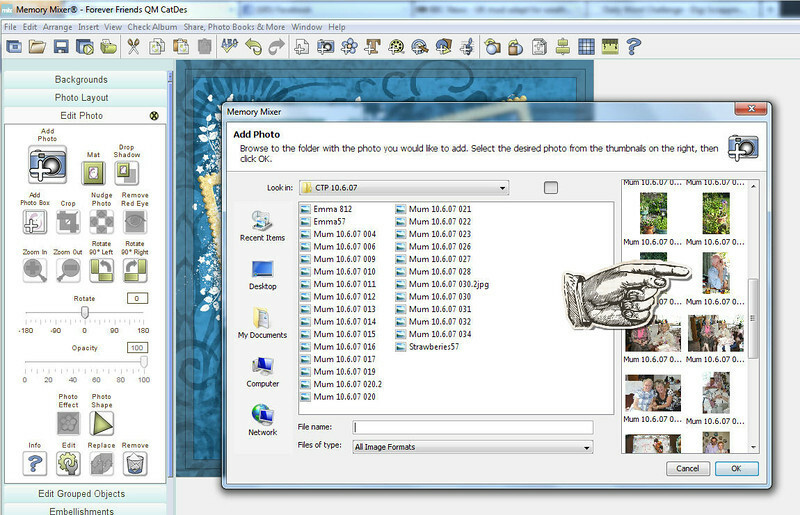 Click on the folder icon to select the location you want. As you can see, I have my albums on an external hard drive. The program will take a moment or two to get your quickmix ready then you will see small icons of each page at the bottom of your screen. You can work on any page you want, just click on the icon and the page will appear on the main screen. You can also re-order your pages by dragging the small icons to where you want them. As you can see, the page is all ready to go apart from the photos. All the embellishments are there BUT you can move them around/delete/copy them if you want to. 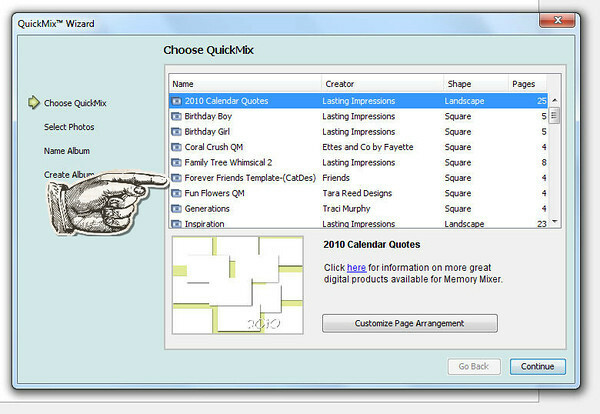 You CAN'T do this with quickpages. Double click on a photo box. In My Memories you would need to move the frame out of the way first. You don't need to do that with Memory Mixer, you can click on the photo box no matter what surrounds it. This window will open to allow you to browse through your computer and choose the photo you want. Do the same with the other photo box to add a second photo. If you change your mind you can click on any photo on the page and use the various options in the left hand menu to edit the photo or replace it with another one. We'll go through those options in another tutorial. Here's a higher res version of that page for you to admire... I added shadows to the embellishments. More on that in another tutorial. I also added the "friends" title from CatDesignz' Creme de la Creme Pastels. 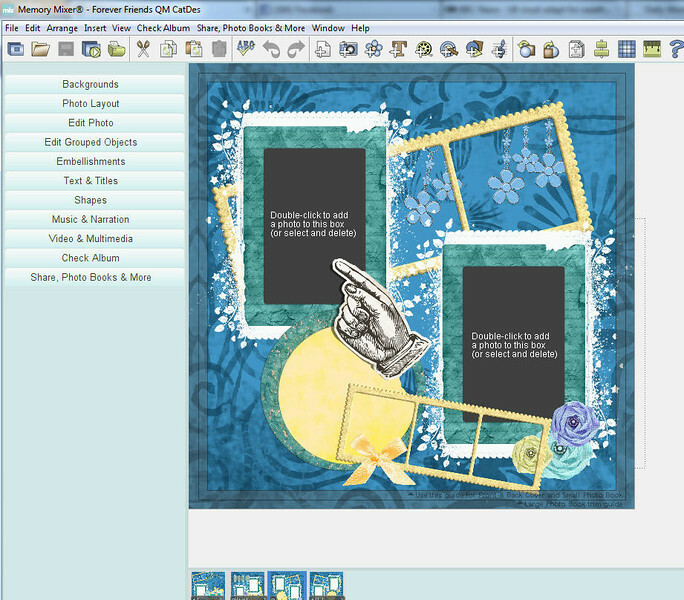 is a MyMemories template, Forever Friends by CatDesignz. 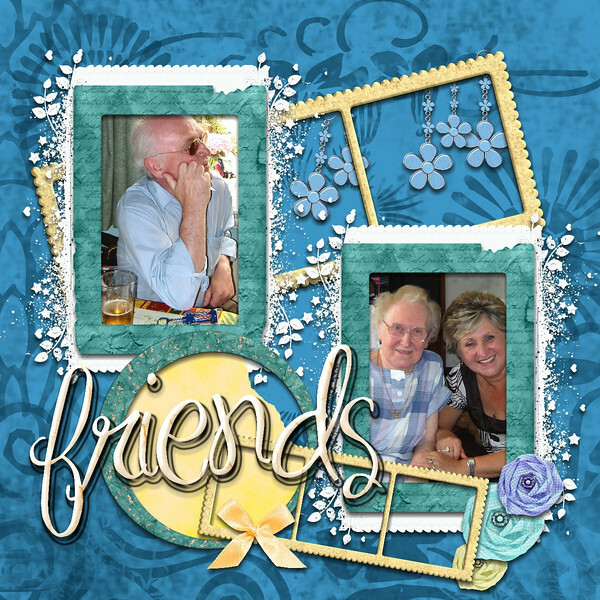 The friends word art is from the Creme de la Creme Pastels kit. You might also like the Friendship Photobook. 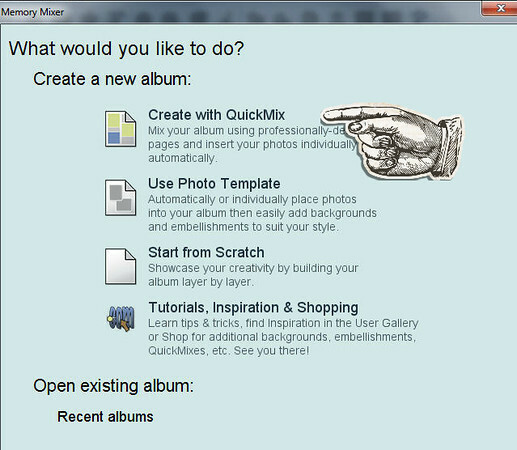 MMS templates work the same as quickmixes except they are easier to use in Memory Mixer because you don't need to move things out of the way. There are instructions HERE about installing these templates into Memory Mixer. Just click here to take advantage of our special deal. We're happy to help on the Digi Scrapping Divas Facebook page!